It’s fresh. It’s new. It’s really quite good. If you are working on a Comprehensive Needs Assessment, this can be your number one go-to tool. It’s loaded with information for building data skills, while you work on your CNA. Check out this link to see what’s included in the book. Order the book here, – and enjoy getting data smart! And please, tell a friend! What we do as part of the Comprehensive Needs Assessment matters. It begins with the on-going analysis and review of data and should result with a plan that makes a difference in lives of students and those who support them (you). We have a long way to go to truly build actionable plans that will make a difference. So many plans are designed to be more for compliance than for improving the lives of students. The CNA process is where the school team figures out what to do about the issues it is facing. It’s about learning for all. It’s about opportunity for all. It’s about being intentionally inviting toward all. It is a lot to think about, but that’s one of the reasons the CNA process is collaborative! The ground-breaking tool not only has what you need to work through the CNA process, but I’ve also included all of the templates, too. Loads of them. Over 100 in all. Templates for data. Templates for problem-solving. Templates for Root Cause Analysis that you probably have not used before. Templates for name plates, agendas, sign-in sheets, school improvement plans, Smart sheets, and so much more. And, the templates are so easy to retrieve. They are all right where I talk about them in the toolbook. There’s no going to the back of the toolbook, or another source, or a website – it’s all right there. How about a quick preview? Want your own copy? Here’s where to order. You’ll be amazed at the power of the protocols you’ll have in your hands! As school teams work through their Comprehensive Needs Assessment process, an important task is that of determining the data points to consider for determining whether the objectives have been met. The challenge for school teams, is there is usually more than one data piece that can be tied in because we (1) want to triangulate data, and (2) can’t really say that one action led to one result. It’s more like, “We’ll be taking this set of action steps, and as a result, we expect to see differences in the data in these areas.” Rather than chug all the data together, I recommend school teams to organize data by content area. The accountability systems across the nation look at assessment results by content area, so schools are held accountable for those results. In all fairness to themselves, they need to see where they stand. More importantly, for many improvement efforts, the work is also planned and implemented through a content area as a natural organizer, such as reading. For many school teams, figuring out what Key Performance Indicators to use is an issue that is easy to resolve. It starts with an understanding of the types of data that might be used for a content area. So today, I want to share a visual with examples of data points that could be used in the content area of reading, or English Language Arts. I have divided the data into three categories: Learning for All, Opportunity for All, and Inviting for All. The purpose of the three categories is to ensure that a school is looking at required data for ESSA. So, under Learning for All, you’ll see data about proficiency and growth scores on state and benchmark assessments. This data is disaggregated by subgroup, and also looks at achievement gaps. This category can have other types of data as well including grades in courses and percentages of students earning successful scores on AP exams. The Opportunity for All category provides data, related to reading/English Language Arts, that might show students have equitable opportunities. The data reflects enrollment in honors courses, AP courses, special education, and more. It also includes percentages of students receiving assistance, as that is what school improvement is all about. In the Inviting for All category, the data includes climate data that matches well to reading. It reflects that inviting aspects of what a school team might like to see: students who love to read books and understand what we ask them to do. Students who feel like they are successful readers. Teachers who feel like they know what steps to take when students struggle – and have the tools they need to take those steps. And then parents who know the value of reading. 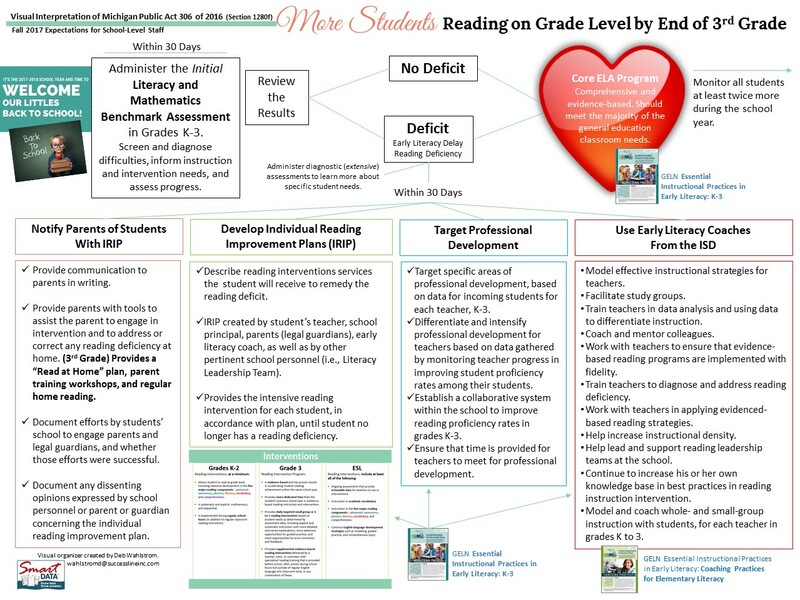 As what we work on year-in and year-out for students in the area of reading, these three categories reflect an overall picture – from the head to the heart – of how things are progressing. Get to Know Michigan’s New Reading Law – in this beginning-of-year activity, staff will learn key information related to the new reading law through a custom graphic organizer and a corresponding question set. (This is specific for the 2017-2018 school year.) I actually had a lot of fun designing the graphic and I hope you’ll enjoy using this with your teachers. You know superintendents want you and your teachers to know this information! Join Deb at ASCD in April 2016! I’ve got some great news; I’ll be presenting again at ASCD’s Annual Conference! If you’re coming to the ASCD Conference in April 2016, I hope you’ll consider attending my session: Protocols for Using Data in Instructional Learning Cycles. Built around ASCD’s theme, “Learn, Teach, Lead“, this session will provide friendly tools and protocols for working with instructional learning cycles. If you’re a teacher, you’ll find some great ideas here – ideas that come your way in a teacher-friendly way. If you’re a principal, you’ll also find some terrific ideas, as I’ll have tools that will help you when working with your teachers. If you’re in the central office, this is a strong session for getting additional ideas for working with your staff, too. It’s official. You have likely heard that the new cut scores were coming. Well they’re here. 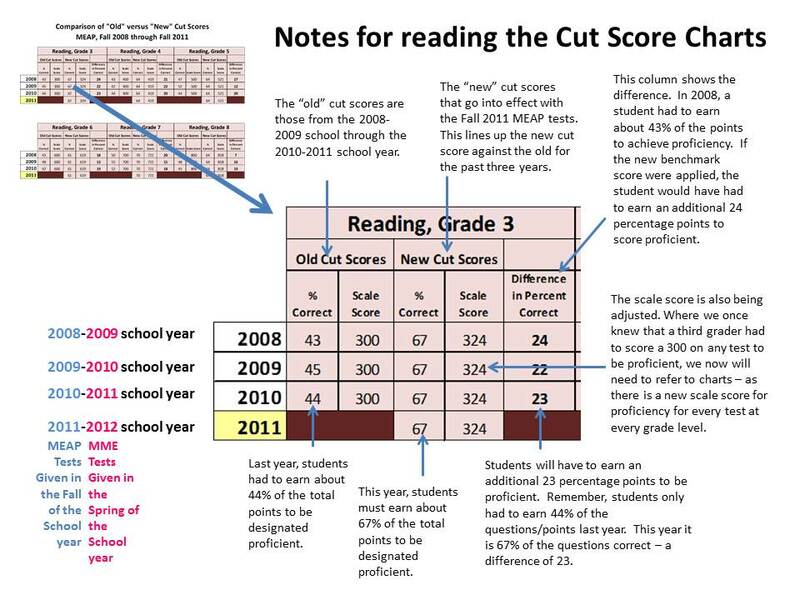 When the MDE sent a memo out this week reminding everyone that historical data with the new cut scores attached would be released on Novemember 3, 2011 – I jumped into action. I’ve put together a few materials that should be useful to you as you get to know your new cut scores. DOWNLOAD THE 14 PAGE PDF HERE. And do let me know if there’s anything else you need. Exit slips are as tool to check for understanding and get a sense of where your kids are on just about any topic you want. They are so easy to implement. I’ve written basic directions and examples for using exit slips in your classroom. Don’t let this idea slip away! Click here to download the three-page document for working with exit slips. A quick-write is a literacy strategy that can be used in any content area. In this activity you give students a topic or let them choose one of their own and then give them five minutes or so to write quickly about the topic. 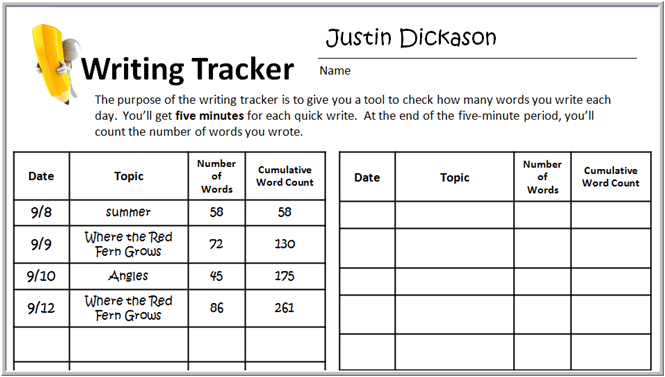 I’ve included brief directions for using Quick-Writes with your students and an example of how to have students fill in their writing logs. Download the materials now and give the technique a try! After students talk about the information in the graphs, based on the guiding questions you provide, have them write a summary of what the graph says. You can make this a short and sweet summary that uses bullet statements or you can have students write a full paragraph. When you give students a chance to talk about the questions BEFORE having them write, they’ll do a much better job with the summary. Use the graphs. 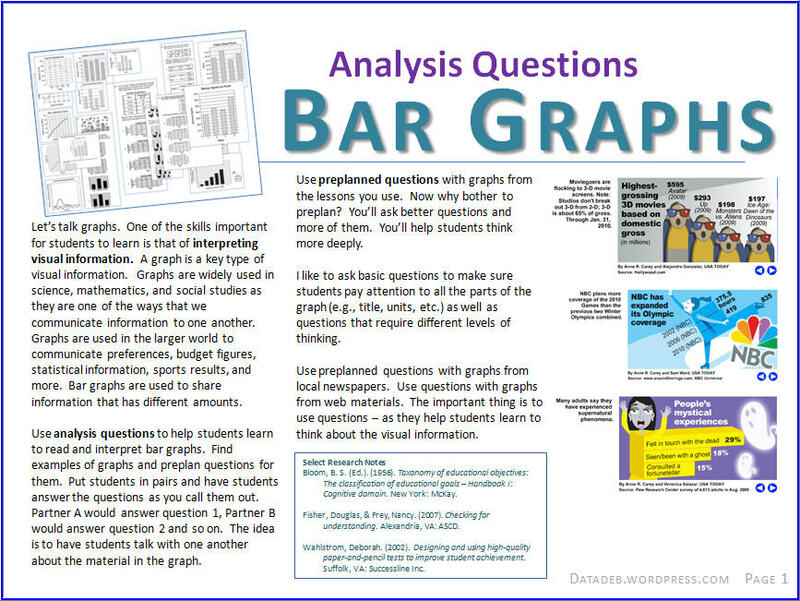 Get students talking about the information in the graphs. Watch them develop deeper understanding because you guided them through deeper thinking of the material. And as always, don’t forget to add your own good questions. You may even want to add some here! 2019 © Deb's Data Digest. Crafted with love by SiteOrigin. Proudly powered by WordPress Theme: SiteOrigin Unwind.